Home Fish Science How Old is This Fish? How old is this fish? This is a question I’ve heard asked many times and unfortunately the answer is generally not that easy to come up with. Fish, like every other living thing, will have different growth rates depending on a host of factors including: genetics, average water body temperature, location, affects of seasonal changes (e.g. duration of winter, ice coverage, oxygen depletion in warm summers), available forage (size, type and abundance), effects of pollution etc. Age measurements using the bony structure of the ear (otoliths), scale, and dorsal spine cross-sections are a useful tool for biologists but are not much good to the average catch and release fisherman (you are releasing those big fertile spawning females, right?). So how do we get an idea about the age of the fish we just caught? For specific water bodies and certain species, a decent correlation between average length and age can be made and there have been a number of studies that show this. A good table that shows how sizes vs age can change depending on locale is presented in reference 1 and is reproduced below (Table 1). Table 1. 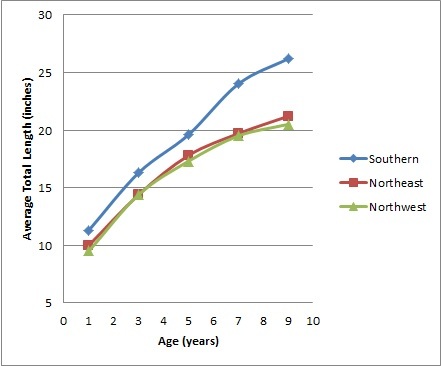 Walleye length vs age at various latitudes (from Reference 1). There is an interesting effect called “warmwater burnout” in which fish at more southern latitudes grow very quickly but do not live as long as more slower growing northern fish (see for example Claytor Reservoir in Table 1 above – few fish found over the age of 8). However, due to their longevity, the maximum size of many northern fish populations is not usually much smaller than those in the south. For many species there will also be an enormous difference in growth rates for males vs females, with very large fish being almost exclusively female. For example, in a survey of The Lake of the Woods (2), male sauger topped out at about 12.5 to 13.5 inches, while females at the same age were 14 to 15.5 inches in length. Females also tend to live longer then males for many species (including walleye, sauger, yellow perch, cisco, northern pike etc.) adding to their maximum size potential. 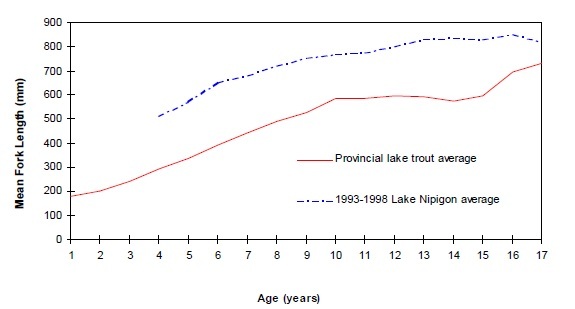 Lake trout size vs age for the province of Ontario (average) and Lake Nipigon (from Reference 3). Walleye length vs age for Ontario. The southern region is all areas of Ontario below the Mattawa and French Rivers (adapted from Reference 4). 2)T. Mosindy, J. Mucha, 2005, Fall Walleye index netting of South Sector 5, Lake of the Woods, Ontario (1997 and 2002) Ont. Min. Natur. Resour. NWSI Technical Report TR-137. 3) A. van Ogtrop, 2000 Fisheries Data Summary: Angler survey 1993 to 1999, Ont. Min. Natur. Resour. NWST Technical Report TR-129. 4) Walleye State of the Resources Report for Southern Region, Ont. Min. Natur. Resour. Fish Age, Fish Length, Fish Science.